November 14th & 15th I Terra Gallery – 511 Harrison St. The only fully customizable exhibitor packages in the industry! At getgeeked, we don’t believe in offering restrictive pre-configured exhibitor packages like all the other events. Instead, we let you create a customized exhibitor package designed to meet your specific objectives… and budget! All you have to do is fill out the form below and hit submit. Only exhibit space (Section II) is required to participate. After you select your exhibit space, go through each section to see if there’s anything you want to add to your package. Even if you choose not to add any additional content or marketing elements, you will still receive the entry-level package described to the right. Once we see that the form has been submitted, we’ll send you a contract and a link to our Exhibitor Promotional Form where you provide us with the information we need to promote your participation. After you return the contract, we’ll send you an invoice via Freshbooks. If you have any questions or want to discuss all the options, shoot us an email or click here to schedule a call with us. We’d love to hear from you. *This form is for getgeeked San Francisco 2017 only. For information on our Boston event in October, click here. To sign up for the basic exhibitor package, just select the 6′ table exhibit space option in Section II (“EXHIBIT SPACE OPTIONS”), and click Submit at the bottom of the form. Here’s what’s included. *For qualified startups, the cost is even less. Check Section VII (“SPECIAL OFFERS & DISCOUNTS”) of the form for details. Please list the names and emails of anyone else you would like to receive event-related updates and information. Regardless of what size space you select, your getgeeked SF package automatically includes: 1) website branding, 2) press list access, 3) social media contest participation, 4) shopping zone participation, 5) Best of Show entry, and 6) post-event attendee survey results. 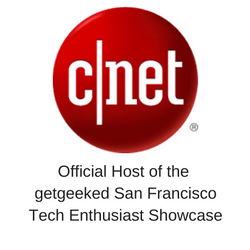 All getgeeked SF exhibitors also receive 20% off their first Techfluence Research Project. All exhibit space options include 1) 6" table with linen, 2) two chairs, 3) WiFi access, and 4) electricity. 3. Would you like to reserve a Private Briefing Room? 4. If you answered yes to #3, please tell us how many 30 minute briefing room sessions you would like to reserve. 1. Onstage product launch, press conference or other presentation. NOT AVAILABLE AS PART OF THE SPECIAL PROMOTION. Share your getgeeked SF experience with a custom sizzle reel that showcases your entire participation, including booth interactions, speaking opps, giveaways, and more. For an example, go to http://gtgkd.co/2u4Fen0. Be part of getgeeked@Night, the official live stream of all getgeeked events. Participating companies will be interviewed in the getgeeked@Night Studio on the show floor. Interviews last approximately 8-10 minutes. All interviews are recorded, redistributed, and provided to the participating company after the event. Receive a raw 90-second video interview recorded at your booth that's perfect for sharing with your fans after the event. 5. Inclusion in post-event "Powered by Geeks" Buying Guide. The only Buying Guide in the entire consumer tech category powered by the social content of real geeks! Participation in event social media contests is required to be included in the post-event Buying Guide. For an example, visit http://getgeeked.tv/2017_holiday_guide/. Recieve a ready-to-share slideshow featuring photos and social media posts to share with your fans after the event. For an example, please visit http://gtgkd.co/2tp5vMw. getgeeked San Francisco Presented by You! Be the brand everyone sees everywhere the getgeeked San Francisco logo is placed. NOT AVAILABLE AS PART OF THE SPECIAL PROMOTION. 2. Select the branding positioning you would would like in all online and print marketing materials. Nobody does exhibitor listings better than getgeeked. To see an example, visit http://getgeeked.tv/ggsf16-exhibitors-page/. Stand out from the crowd with our best-in-the-industry enhanced exhibitor listings, Enhanced listings include photos of the products you're showcasing and the company representatives staffing your booth . To see an example, visit http://getgeeked.tv/ggsf16-acronis/. 4. Logo placement on the official getgeeked San Francisco T-shirt? Select YES below if you would like your logo on the official getgeeked SF T-shirt given out to all attendees. To see an example, visit http://gtgkd.co/ggNY15T. 5. Logo placement on the official getgeeked San Francisco goodie bag? Select YES below if you would like your logo on the official getgeeked SF goodie bag given out to all attendees. To see an example, visit http://gtgkd.co/ggNY16GB. For an example, visit http://gtgkd.co/ggROI_Report. Our post-event attendee surveys are packed with info, but a Custom Section will allow you to get feedback specific to your participation. For an example of the basic report, visit http://gtgkd.co/ggSF16_Attendee_Report. Want even more feedback? Contact the geeks directly after the event. You can thank them for coming, provide them a special offer, or ask for feedback. Whatever you decide, post-event attendee emails are a terrific way to turn the interactions from the event into lasting relationships. 1. Select any exclusive sponsorship opportunities you are interested in and we will contact you to discuss pricing. 1. Select all getgeeked discount programs that are applicable. All getgeeked discounts listed below are cumulative! getgeeked SF startup discounts cannot be combined with other discounts listed above. 1. Input your estimated package cost below. Don't worry. We'll double check everything and the email we send with your contract will list the items you've selected so you can make sure it's the package you want before you sign the contract. Questions? Comments? Special Instructions? Just want to discuss how your company can get the most out of getgeeked SF? Email us @ sponsors@getgeeked.tv or just click here and schedule a call with us.